When I chose this book from Netgalley, I wondered if information about a national disaster could be distilled into a meaningful (and appropriate) children’s book. The answer is: absolutely. THE PLOT: Louis Daniel is a 10-year-old boy who lives in New Orleans. When the levees break, Louis’s family is forced to abandon their home and try to make their way to safety. But in the Superdome, Louis’s father becomes separated from the rest of the family. What can a little boy do to help find him in all the chaos? MY TWO CENTS: The book does a fantastic job of making a connection between Louis and a little lost dog. As I’ve mentioned in another post, sometimes people feel more strongly about animals than they do about human victims. Children especially will be more interested in a poor abandoned dog who finds a happy home than they would be in human refugees, yet the point is made. Also, it’s wonderful that Louis gets to use his musical talent, and the one item he took from their flooded house (his horn), to help his father find them in the Superdome. It makes Louis the hero of the story in a believable way. It emphasizes that children can use problem-solving skills, and the talents they develop can be used in ways they wouldn’t necessarily imagine. The illustrations are very nice. They show the family’s danger, but aren’t overly scary. 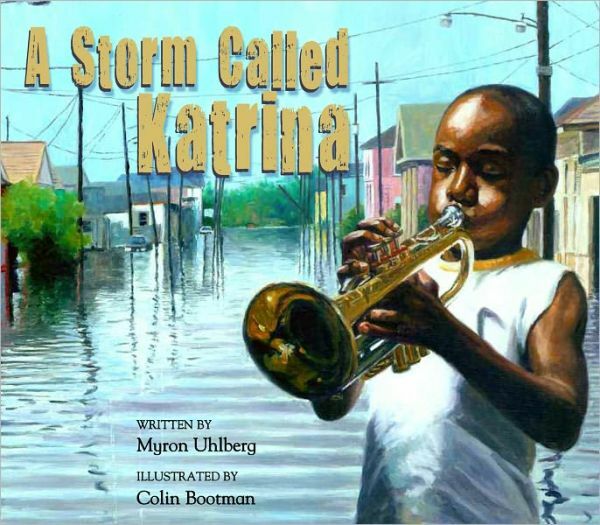 BOTTOM LINE: If your child asks questions about disasters such as Katrina, or you feel your child should be gently exposed to some of the harsher realities of life, check out this book. It’s a way to introduce a difficult subject while still highlighting the positive elements of human survival. TEACUP RATING: Five out of five teacups. The recommended age is for Age 4/preschool and up, but I think first grade (Age 6 and up) might be more appropriate. Really, it depends on the maturity/reading level of your child. As always, read the book yourself first to make a determination. ON SALE DATE: The book is available now in hardcover.